It’s a warm spring night. I’m outside, sitting on a stone wall by the Keeper of the Plains along the Arkansas River. I’m surrounded by lots of people. The torches around the statue light , revealing a picturesque scene at the base where our two rivers meet. Kids bounce around. Couples caress. Intimacy ensures. I’m in the midst of a destination hot spot for ICT romance. Much to my surprise, I notice that it’s not just the straights holding hands. An arm locked, older lesbian couple stands behind me as a boy-duo skips gaily along. They blend into the crowd; no one bats an eye. For all the talk of “hetero-hysteria” over public displays of homo affection, everyone seems to be peacefully coexisting. Progress is in full view. This isn’t something you’d have seen in Wichita ten years ago. Then my blackberry beeps. I have a new e-mail. It’s from a woman named Neepa. She’s responding to my call from a previous column to interview people from different cultural or ethnic backgrounds about their experience being gay in Wichita. She’s a self-proclaimed lesi-Desi, an Indian woman who loves other women, and has lots to say on the topic of her culture and its attitudes toward homosexuality. She would love for me to interview her and feature her in the magazine, but there’s just one problem—her husband would get very upset. To my back, two women are being their true, free selves in the presence of all who surround; in the palm of my hand– across a digital divide–another woman’s freedom to be true to herself and those around her is eclipsed. Apparently, closets painted in “White Privilege” open a lot easier than those “Made in India”. Neepa (not her real name) pours her heart out to me in the e-mail, giving me permission to use the material if I change enough details to protect her identity. She knew she liked girls when she was a teenager. In college, she had several girl-girl romances. That was when she was far away from her parents, though. They knew nothing of her Sapphic proclivities. After she graduated, her family began pressuring her to get married. “In my culture, you had better get married by the time you’re 23 or something is not right,” she explains. The family already had their suspicions, but they decided they could “fix” any problems by rushing a marriage. She tried to fight off her parent’s instance that she find a guy to “settle down” with, but ultimately that proved too difficult for her. “My parents had decided that I should marry the son of my father’s business partner. It was made very clear to me that I could either do this or be cut off—not just financially, but emotionally. I had to make a choice. It was my family or myself. I choose my family,” she said. A consequence of that choice is that she’s living a double life. Neepa admits to carrying on affairs with other women. She says her husband has no idea. “I know that lying is wrong, and I want to get out of this situation,” she confesses. “My husband is a good man who deserves a woman who truly wants to be with him. I can’t give him that.” Right now, she’s trying to fight off pressure from him and both of their families to have a baby. She secretly takes birth control. “I don’t want a child to be born into these lies,” she says. The torches dim as I finished reading the e-mail. Under the starry Kansas sky, I’m able to be myself and live my life exactly how I want. Others around me are doing the same. As the waters of the Arkansas and Little Arkansas Rivers blend into one body, we blend into one community. Yet somewhere in Wichita, a husband falls asleep in a bed of lies, caressing a wife drained from banging a cultural tango. To the truth through difficult. Gay Civil Rights. Black Civil Rights. Gay civil rights, black civil rights. Same issue, same struggle, right? Not so according to one very introspective ICT African American lesbian. Though she had to conceal her real name and identity, “Gail” offers a stripped down glimpse into what it means to be gay and black in Wichita. She was kind enough to share her “naked” thoughts with all of us. Gay people have never been systematically rounded up, loaded onto horrific boats, and sold into slavery. They haven’t suffered the same systemic economic and social inequalities throughout history. Gay people can also walk into a room without everyone knowing their sexual orientation.” When you’re black, you can never conceal your race. Gays can choose to hide, but when you’re black, there’s no hiding from prejudice,” Gail points out. 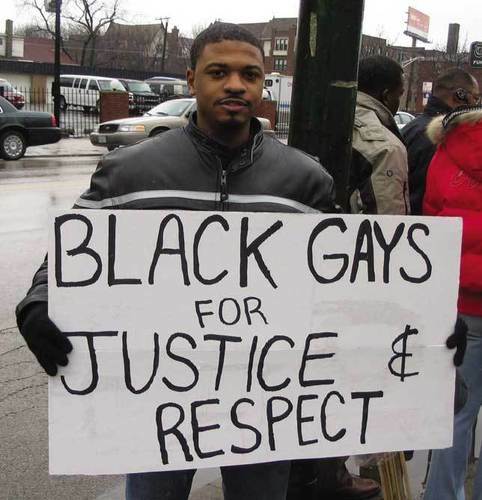 It’s no secret that the blacks and the gays don’t always peacefully coexist. Nationally, African Americans are far more resistant to accepting homosexuality than Caucasians. When Proposition 8 passed in California, 90% of black people voted for Obama, while at the same time 70% of them elected to outlaw gay weddings. Religion is a big factor in the divide. African Americans are a religious and church-centered bunch. Many sociologists contend that it’s socioeconomics, not race, though, that plays a central role in black homophobia. Gail concurs. “It’s about education. The more educated a person is, the more accepting they tend to be. The education rates are lower among blacks and that’s part of the problem. If we want to address homophobia, we need to also address access to education. We need to get serious about ending poverty,” she said. “Gay people also need to stop being afraid to come and talk to us. Part of why Prop 8 passed was due to the fact that the white gay leaders were too scared to outreach to black communities. They viewed us as the enemy, and so we voted that way,” Gail said. Gail believes, though, that an opportunity exists locally to move the dialogue forward…but she admits that some things have to change first. It’s this close-knit spirit that Gail sees as the biggest opportunity for progress. She believes that local gay rights groups need to do a better job building relationships with black leaders. She says they shouldn’t be afraid to get into the churches and meet with the ministers, too. “Really, if more people were just honest and spoke from the heart, this issue would be go away. I know so many parents who have gay kids and they just hide it from their friends. When it comes to black gays, the parents are in the closet just as much as their kids,” she said. Gail struck me as someone who could, herself, be a powerful communicator within the black community for the LGBT cause. She’s an active member of her church, a mom raising kids with her partner, and a dynamic professional. She’s out to her family and her congregation. She says most have accepted her. I was surprised when she requested that I conceal her identify. “This is Kansas, and where I work, we don’t have a non-discrimination policy. Until we do, I’ll have to be a bit on the down low myself, sadly,” she said. Gay civil rights and black civil rights aren’t the same fight, but it seems they have bigotry as a common enemy.